This GE top-freezer refrigerator is designed with the freezer on top and the fresh food compartment in the lower portion. It features up front control panels along with vegetable crispers and two full-width wire shelves. You'll never be faced with a shortage of food storage space again with this 5.5 cubic foot (156 litre) chest freezer. You'll also see your electricity bills drop thanks to the insulated lid and cabinet. There's an easily-accessible mechanical thermostat mounted on the front and the rust-resistant interior liner is constructed with aluminum to make it a breeze to keep clean. The drain is also mounted on the front which makes for fast and simple manual-defrosting maintenance. All of your favorite food items can be stored near the top with the convenient storage basket, making them easily accessible. This popular model also offers peace of mind with its 5 year warranty on parts and labor with in-home service. The ideal unit for homes, offices, apartments, condos and cottages, this stylish Danby chest freezer takes up minimal space, but still offers sufficient storage thanks to a 5.5 cu. ft. capacity. The vinyl-coated basket allows you to separate your favourite food items, while the interior liner has been specifically designed for easy cleaning. Your energy bills won't shoot through the roof either since it features a foam insulated cabinet and rounded lid - specifically designed to keep the cold in and the heat out. 17.5 Cu.Ft. Top-Freezer - ENERGY STAR® This GE top-freezer refrigerator is designed with the freezer on top and the fresh food compartment in the lower portion. It features up front control panels along with vegetable crispers and two full-width wire shelves. 17.5 Cu.Ft. Top-Freezer - ENERGY STAR® is rated 4.4 out of 5 by 1374. Rated 2 out of 5 by Scott from The refrigerator dose make noise not real bad but not... The refrigerator dose make noise not real bad but not near as quiet as the one I had which I paid much less for. 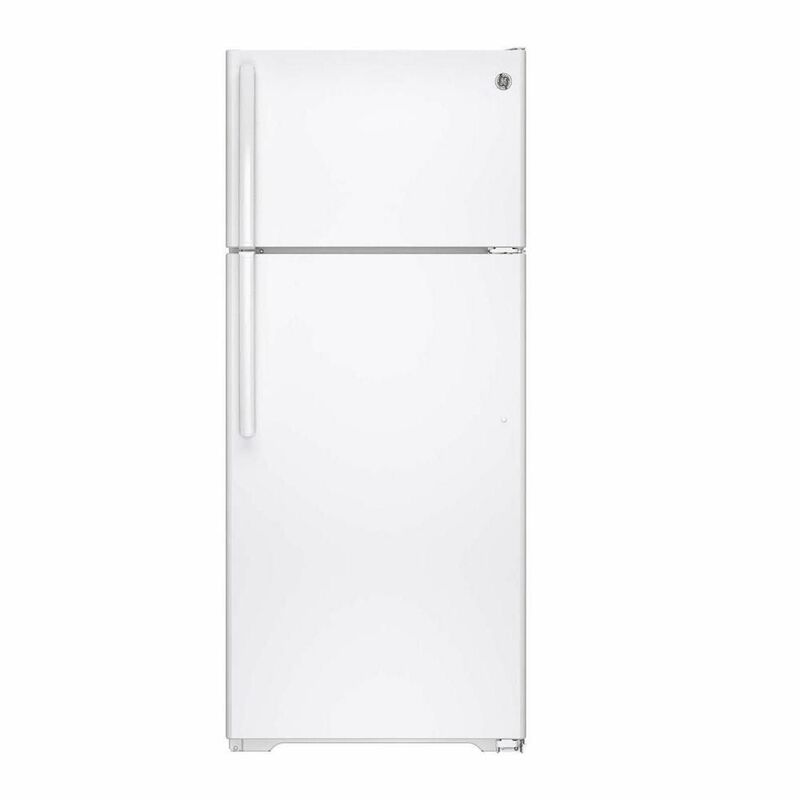 Rated 1 out of 5 by LAL22 from Loud and cheap I bought this item a couple of years ago and surely enough right after the warranty is up the fridge starts to make a lot of noise. We got rid of our old one because of the noise but this one is louder than our old one. The freezer does not keep ice cream frozen, but if you like soft serve - this is your freezer! The fridge freezes anything put near the back on the bottom shelf. The temperature control is only one dial that controls the whole thing, there is no happy medium. Seriously disappointed and think this is a piece. Rated 5 out of 5 by JT 553 from Large interior and runs quietely Great for our small family. Love the bisque color. Rated 5 out of 5 by nannyb56 from Love the color I had a working refrigerator, but it was white and the rest of my appliances were slate. I finally broke down and bought this and couldn't be happier. My kitchen looks great! Rated 2 out of 5 by Oma12 from Disappointed Disappointed in quality of side walls as they are very thin and become dented when removing shelves. Rated 5 out of 5 by java333 from A perfect little fridge! It's a great buy with basic features! It's really great of single people or small apartments! Rated 4 out of 5 by Johnm01453 from Clean Lines It would be nice if it were quiet. Also, if the door did not swing out on its own. Rated 5 out of 5 by Johnp1954 from nice unit the features and size of the unit are perfect for the two of us since we downsized. the finish is good for not showing any fingerprints or smears.